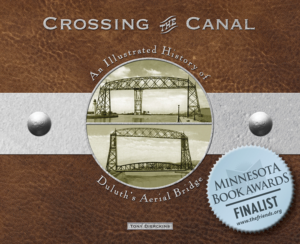 Duluth’s lift bridge operates on the simple principle of balance. The one-thousand-ton bridge is connected to two five-hundred ton counterweights, one on each end, via twenty-four 2-inch wire ropes (cables) which are draped over enormous twelve foot-diameter sheave wheels (pulleys; Installed in 2000, the 2-inch cables replaced 1 7/8-inch cables last replaced in 1985). The cables themselves weigh about five pounds a foot, and there are forty-eight of them in total, twelve on each corner of the bridge. Just as the counterweights counterbalance the bridge, something needs to counterbalance the cables; however, because the length of the cables on the bridge side of the sheave wheels decreases and increases as the bridge raises and lowers, the amount of weight required to counterbalance the cables also decreases and increases. That’s where two giant chains come in: the chains each weigh 252 pounds a foot (The twenty-four cables on one end of the bridge weigh 5 pounds per foot each, coming to 120 pounds per foot all together; once you take into account that the cables are over twice as long as the chains, the weights balance out nicely) and are connected on one end to the bottom of the counterweights and on the other end to the steel non-moving towers of the bridge. As the bridge raises and the counterweights descend, an increasing amount of the chains’ length, and therefore an increasing amount of the chains’ weight, hangs from the steel towers rather than from the counterweights. So as the length and weight of cable on the bridge side of the sheave wheels decreases, the length and weight of chain supported by the counterweight also decreases, maintaining the balance that is so critical to proper operation. Four 125-horsepower Westinghouse Induction motors are used to move the bridge. Only two motors are needed to actually move the bridge; one at each end. The other two are back-ups. The motors are attached to winching drums (two at each end) that wind the bridge up or down on eight 1 1/4-inch wire ropes (two per winching drum). With today’s technology, most of the communication between the bridge and vessels is done via marine radio. A merchant will usually give a “security call” when they are about one hour out from Duluth piers, or about fifteen minutes from leaving the dock, informing all concerned traffic of their intentions. (Small craft just show up and ask for a lift.) When the vessel is about one and a half miles from the bridge inbound or just starting its turn to lineup with the bridge outbound, the captain calls the bridge and requests the bridge to lift. The goal of the bridge operator is to have a twelve-minute lift, or to block vehicle traffic for no more than twelve minutes. The operator, based on experience, will raise the bridge according to the vessel’s speed, or the need for safety. The vessel always has the right of way and the captain can direct the bridge to open if he or she feels it necessary. When the operator starts the lifting process, he or she first sets in motion a sequence of events that must occur before the bridge actually moves. First, a recorded message is played, informing tourists and pedestrians that a lift is going to be made. After the message completes, the traffic lights cycle to yellow and then to red, gongs start sounding, and the “Warning: Restricted Area” lights on both ends of the bridge start to flash. When the traffic lights turn red, an interlock releases and allows the operator to lower traffic gates. (Usually oncoming traffic gates go down first, allowing traffic to clear the bridge before the off-going gates are lowered). When all traffic gates are down, another interlock releases and gives a blue light on the control console which indicates that the bridge can now be raised. Before the “raise” button is pushed, another operator steps outside on the catwalk and visually checks both sidewalks and the roadway to be clear of all persons and vehicles. When the bridge is clear, the operator checking the sidewalks give a “thumbs-up” to the operator running the bridge. The operator will then check the security cameras and press the “raise” button. As the bridge starts up, the operator will monitor the cameras to ensure nobody runs up and gets on the bridge or is hanging on underneath. Once the bridge is too high for that to happen the operator relaxes a bit and monitors the lift.